For exhibitors, this is the home stretch for 2018 SEMA Show planning. Whether your goal is increasing your company’s profile or generating leads, there are several must-do steps you can take right now for success. 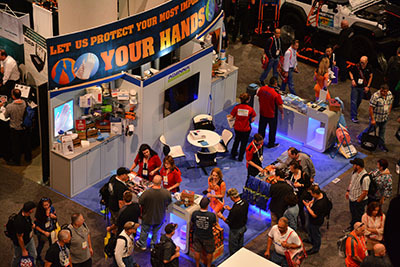 With opening day of the 2018 SEMA Show set for Tuesday, October 30, now is the time for exhibitors to make their crucial last push toward attracting buyers to their booths. According to SEMA Trade Show Director Tom Gattuso, more than 60,000 buyers are expected to attend this year’s Show, and a large percentage of them are already determining which exhibitors they want to see. First, as you finalize and review your Show plan, make sure that you’re well versed in all of the SEMA Show’s nuts and bolts. Staying on top of booth logistics, hitting deadlines on time, controlling costs, and knowing “where to go for what” are all basic to creating a booth atmosphere conducive to doing business with buyers. To help guide first-time and veteran exhibitors alike through all the Show-planning particulars, SEMA makes a comprehensive (and free) Exhibitor Services Manual (ESM) available online at www.SEMAShow.com/esm. If you envision the Show as a series of five-minute conversations with buyers, that averages to about 93 conversations per day and 372 by end of week. Make every minute count by familiarizing yourself with your booth’s layout and honing your product pitches before the Show. “More than two thirds of buyers say that they come to the Show already armed with a plan of the companies they want to see, so you’ve got to reach out early,” Gattuso advised. “Make sure your information is up to date in the online floorplan, and begin your pre-Show marketing. You should email your buyers and announce that you’ll be at the Show. Maybe put a sticker on your invoices or anything else you can think of to let them know. Upload your latest news, media tipoffs and product releases now and throughout the Show at www.SEMAShow.com/press. The first product entry to the Showcase is free, with additional entries costing $75 each when submitted before October 5 and $150 thereafter. There’s no cap to the total number of products a company can highlight. Moreover, if your company doesn’t have a new product, don’t fret—you can still enter featured products as well. Moreover, participation in the Showcase yields dividends long after the Show, since every product is photographed and featured in later SEMA publications and made available to media year-round via the SEMA Show website. The high-quality images are also available for use in your own company media and advertising. For additional entry information and display guidelines, go to www.SEMAShow.com/new-product-rules. Many buyers build their daily itineraries around what they see in the SEMA Show New Products Showcase. Make sure you grab their attention by entering at least one new or featured product into the Showcase. The first entry is free, so there’s no reason to pass it up. While tackling the above pre-Show basics, now is also a good time to review your plan for the Show floor—especially the booth itself. Gattuso recommends establishing a main goal and building out your plan from there. “Look at everything through the prism of the buyer,” he said. “Recall that a buyer’s goal is to find new things. With that in mind, if your goal is to increase awareness of your business, the way to attain that goal is to feature your latest products. Presenting your new technology will likely bring more success than handing out lanyards and freebies. The same applies if your goal is to get sales leads. In fact, it’s a good idea to prototype your booth beforehand at your place of business. At a minimum, map everything out with masking tape on the floor. Make sure everyone and everything in your booth has a specific reason to be there. Know your customers and prioritize leads. Then develop one-, three- and five-minute versions of your basic sales pitch, each quickly outlining what your company does, what your vision is for your place in the industry, and how you benefit the buyer. Practice, practice and practice them in your mock setting until they become rote. Exhibitors’ Show Floor Managers are issued onsite. SEMA Show Management is available in the Show Office for any onsite questions and concerns and can be reached at 702-943-3505 (Show hours only). This number is found on the back of every exhibitor badge. Your account representative as well as an intellectual property attorney can also be reached onsite through the Show Office. We don’t mean literally locked in, of course. But do plan to go the distance, staying at the Show through Friday, since more and more buyers are doing exactly that each year. “Just as important, you want to stay locked in to our support network, which remains in place before, during and after the Show,” Gattuso emphasized. “It involves people such as your SEMA account representative, our sales operations and registration experts, an onsite intellectual property rights attorney, your floor manager, and our Show department staff both onsite and at our headquarters in Diamond Bar, California, prior to and after the Show.